The gluten free craze has hit America hard. Just a few years ago it was difficult for individuals with gluten intolerance and celiac disease to find many foods that most people enjoy on a daily basis. The first time I remember hearing about a wheat allergy was my freshman year in college where I watched one of my guy friends chow down on a pile of lunch meat and I jokingly asked him what he had against bread. He explained how sick he’d get if he had wheat or gluten of any kind and I patted him on the back as I realized how much beer he’d have to give up. In all seriousness though, gluten allergies are serious. Celiac disease is a condition where the body reacts negatively to gluten and damages villi, which are what line the intestines and help absorb nutrients. When people with this allergy eat gluten (found in wheat, rye, barely, and even oats) their body attacks these villi and can make them extremely malnourished over time. Gluten allergies can also cause extreme bloating and uncomfortable stomach problems. So make no mistake, a gluten-free diet is important for people with the allergy. But what about the rest of us? Is eating gluten-free actually healthier? Can it benefit us, too? Actually no. Going gluten-free and eating more gluten-free products can actually cause you to gain weight since most products contain added fats and sugars. Currently, there is not any scientific research showing that eating gluten-free when you aren’t allergic will create any real benefit. Also – look at the current market for food products. Upwards of 7 billion dollars in sales are estimated to be made in 2012 alone due to the popularity of eating gluten-free. While more cases of celiac disease are being diagnosed, doctors are now more aware of the condition than ever before. A lot of people are diagnosing themselves with an allergy they probably don’t have and don’t know much about. And with celebrity endorsements and people claiming that eating gluten-free is a great way to lose weight, many American’s are jumping on board without doing much research. Just because your local supermarket is selling more of a product (and at higher prices) doesn’t mean it’s the healthiest option for you. Going gluten-free can also back fire on individuals trying to lose weight who aren’t allergic. Not only is it expensive to eat gluten-free but as stated earlier, most of these products add in excess sugar, fat, and salt. Eating a gluten-free diet also drastically limits your food options and can make dieting harder and people more likely to overeat in the long run.The key to losing weight isn’t found in any “miracle” diet. Just because you eat gluten-free pizza doesn’t make you any healthier – you’re still eating pizza. Losing weight is about eating less calories, getting enough fiber, and not drastically eliminating anything from your diet in an attempt to lose weight faster. This goes back to my post about carbs and how they are still important. 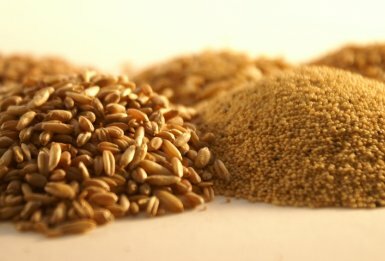 Whole wheat grains provide many nutrients. Without these it can be harder for individuals to sustain blood sugar levels which can induce headaches, make you moody, and extremely lethargic. Gluten-free foods aren’t a solution to eating the same foods you love without the guilt. In most cases, you’re not only eating the same calories but they are also packed with less nutrients (and more fat calories). In comparing gluten free bread to regular – regular bread continually has more fiber, less sodium, and more protein. Proponents may argue that gluten-free has less calories, which may be true, but those calories are “empty” and lack important nutrients. If you are going to eat a piece of bread, you might as well eat one that’s 110 calories and chalked full of the fuel your body needs instead of eating a 70 calorie piece that will leave you feeling hungry and more likely to overeat or grab something sugary. So what’s my ultimate message here? It won’t seriously hurt you to eat a gluten-free product, but if you don’t HAVE to, there isn’t a real benefit to buying and eating these products. The only thing that will get smaller from eating gluten-free if you’re not allergic is your wallet. There’s no way I’m going to lose weight around Thanksgiving so I’ll start after, plus the more weight you have to lose, the easier it will be to come off, I’m practically helping myself with turkey. We all have excuses. But the ultimate goal over the holidays should be less about looking hot in that red dress (although come on, that IS an incentive) and more about staying healthy. The holidays are about love and the last thing you want to do is corrode your arteries with chocolate lava cakes….mmm chocolate lava. Stay active and keep your fitness routines going. OR START ONE! It’s SO easy when we do indulge in good foods to put off the exercise. It’s that all or nothing mentality that can really tear apart your goals. 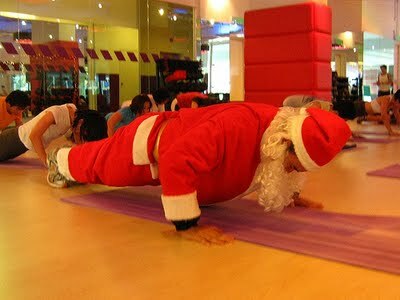 Exercise in the morning before it’s not an option later when you want to go a holiday party. When you start your day off with exercise you’re boosting endorphins and are more likely to feel good about your body and therefore make smart and healthy choices later. Allow yourself to indulge in good foods but make smart choices when you can. If you think you can just glide through the holidays without touching a morsel of something sweet, you’re kidding yourself and everyone around you and may up devouring an entire cake later when you burn out. LET yourself have some good food before the year is over. The key is portions. So many people think that in order to maintain or lose weight you need to give up everything you love but that’s not true. Are you dying for a piece of your grandma’s famous pie? Then have some. Ask for a smaller slice or even just take a bite. Practice savoring rich food instead of inhaling it and think about how it makes your body feel. When you’re out shopping with friends or meeting for happy hours around the holidays, make smart choices. Just because it’s the holiday season doesn’t mean you should use it as an excuse to eat bad things for two months. Grab a wrap or a salad at the food court in the mall when you’re shopping with friends instead of a slice of pizza. That way you can have that cookie later. Encourage others to be active with you. Promise yourself you’ll go on a walk before or after you indulge in a giant meal so that you make smarter choices and don’t feel so sluggish afterwards. Traveling? You may not be able to get your regular workout in, that’s ok and doesn’t mean you lose for the day. Find other options. Ask if others want to join you for a walk. Take a 5 minute break and do jumping jacks, push ups, planks, and whatever else you can squeeze in. It may not burn as many calories as you’d like but it will set you up mentally for the rest of the day. Find healthy alternatives to your favorite holiday recipes. Do you always make chocolate chip cookies for the family? Use one stick of butter in the recipe instead of two. Sub in applesauce for sugar. There are tons of ways to use other (healthier) ingredients to make recipes low-calorie and ditch some of the fat. Think about how you want to FEEL more than anything else. We all worry about the holiday bulge but think back on those days where you’ve seriously over-stuffed yourself. You feel lethargic, moody, depleted, and unenergized. Then think about how you feel the next morning when you didn’t overeat and let yourself have fun but didn’t go so overboard that working out the next day is like sweating gravy. Share the love. Everyone seems to have an uncle or an aunt that loves to make holiday cookies. Don’t think you can’t share these or bring them into work. I know if I leave sweets in my kitchen I will eat them, just me. Don’t set yourself up by putting ammo in your own home that will shoot you after you’ve had a rough day and just want to eat sugar. Keep healthy snacks around like almonds and fruits high in fiber. Eat your vegetables first. Mom was right about this one. When you go out or are hosting a holiday get-together, eat the good foods first. Have a salad, enjoy the high protein snacks, THEN move to the cake. You may just find that by the time your belly is full with the healthy stuff, you’ll be less inclined to try and secretly eat 3 pieces of pecan pie. Stay hydrated! It’s easy to forget to drink enough water when there’s all the holiday beers and cocktails. More often than not we are actually full when we start to get super thirsty – not to mention dehydrated! The more water you drink, the more conscious you’ll be about your appetite. Find fun and active things to do! Hit up the ice rink, go inner-tubing, build a snowman and have a snowball fight. Get some warmer workout gear so your excuse has nothing to do with the dropping temperatures. GET OUTSIDE! It’s getting darker and the days are growing shorter. Lack of sun and Vitamin D can make many people feel sluggish and depressed, so if a sunny afternoon presents itself, get OUT there! Don’t obsess and beat yourself up! You’re going to have days where you have more food and drinks than you planned. That’s OK! Get back at it with the next meal and the next workout. Try to avoid going days on end eating bad things – this leads to bad habits and routines. You may have to work a bit harder over the holidays to keep up the good habits you’ve made but you can do it!